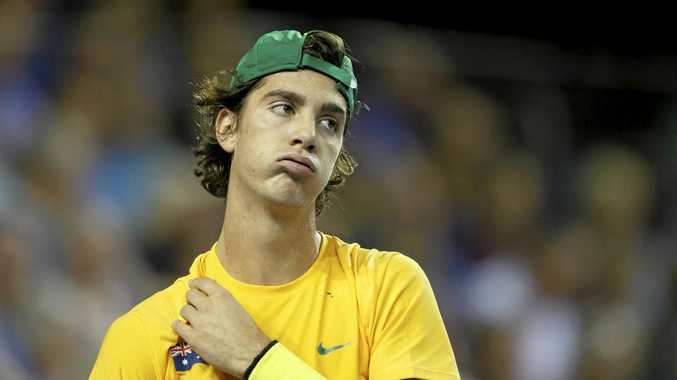 A CAUTIOUS Thanasi Kokkinakis will start back in doubles at the Brisbane International after an injury-riddled 2016, quipping his goal is to finish next year with "able limbs”. Kokkinakis played only one match this year due to shoulder surgery initially and then pectoral and groin muscle issues. The 20-year-old decided he was not ready physically for singles in Brisbane and instead will play doubles with Sydney's Jordan Thompson. Kokkinakis said he intends to play singles in Sydney - whether he plays qualifying or gets a wildcard. His progress would determine whether he is near ready to attack the best-of-five-sets format of the Australian Open, starting on January 16. "The shoulder's been really good. The past few months it's made big improvements, and I'm feeling really good,” Kokkinakis said after practice at the Queensland Tennis Centre. "It's been a bit of groin stuff. It's been my fourth injury this year, one after the other. But I'll get there. "My goal is to finish with able limbs (in 2017). "I'm going to try and play doubles here, obviously with Jordan. I'm going to try and start my singles in Sydney. See how the body pulls up. It's not 100% but it's getting really close now and it's the best I've felt in a long time. Kokkinakis is highly regarded by top-liners including Andy Murray and Rafael Nadal as a potential top-10 player and Australian tennis badly needs him to have a successful and sustained returned to the ATP Tour.